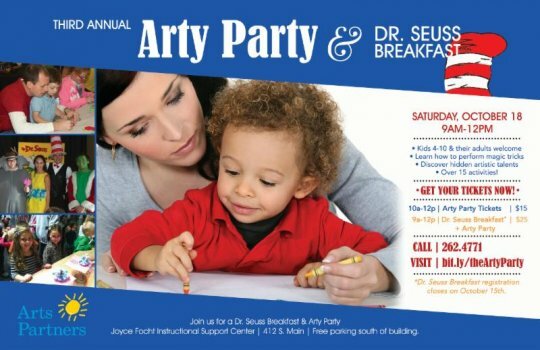 Arts Partners Wichita, an affiliate of Young Audiences Arts for Learning, will be hosting their 3rd Annual Arty Party & Dr. Seuss Breakfast this Saturday, October 18 from 9am-12pm. Participants will be treated to a morning of magic tricks, discovering artistic talents, breakfast foods, and over 15 other activities for both kids & their adults! Tickets $25 and proceeds will go to support Arts Partners Wichita in their mission to provide arts learning experiences that lead young people to think creatively, engage in creative exploration, and work collaboratively. The event will be held at the USD 259 Joyce Focht Instructional Support Center in Wichita.